Entering "macsales.com" into the search bar, which resolves to "https://www.macsales.com", which then starts to load the page but crashes the browser every time. Any further information needed? Please email me, I'll do my best to provide it. Hi their I was able to load this site up and browse it without the browser crashing. Have you tried loading this site in firefox safe mode? If so you might want to try and and reset your profile instructions can be found here --> https://tenfourfox.tenderapp.com/kb/general/how-to-reset-your-profile If none of these options helps I'm out of ideas and maybe someone else can help. I can't reproduce the crash, either. Nor here (also 10.4.11). The crash is a null pointer exception, which can sometimes occur when the system is out of memory. How much RAM do you have? unpaid hours you guys spend doing your work on this project! could take 2 Gb, and this later machine maxes out at less. 2) Reset profile via shortcut. 3) Reset profile via manual method. 4) Tried TenFourFox Safe Mode. time to boot, unlike the normal boot which is pretty fast. In this one instance, the crash DIDN'T happen. can find time to do this later. extremely random, happens less than 1 in 20 uses of this function. 6) Restarted the computer in its Safe Mode. Which took a very long time to boot, unlike the normal boot which is pretty fast. Please clarify: safe mode reliably fixes it, or it just didn't crash one time when in safe mode? If the latter, I'm not sure what to add. If the former, that tells us something important. Safe mode disables certain non-system fonts, system extensions, kernel extensions, startup items and login items. Although TenFourFox doesn't install any of these itself, it interacts with some aspects of the operating system at a very low level to get around bugs Apple never fixed. These aspects are often the same ones such extensions attempt to patch or hook into. The fact that it doesn't crash in safe mode says one (or some?) of those items is conflicting with TenFourFox. Unfortunately, figuring out which one(s) is/are the offender(s) is going to be a tedious process, like debugging extensions on Mac OS 9. You might start with disabling login items in System Preferences and then see what kexts or other extensions you have installed. If you find the offender, please let us know. It might be something we can work around if we can reproduce the problem locally. I have already tried removing the Login Items, with no success. sites, visited macsales again a couple more times, and all was well. of these, fortunately, aren't actually used. In safe mode I used kextstat to see what kexts I had installed, 64.
installed. Saved that list too. party kexts in normal mode. pair are for my M-Audio Delta digital audio and midi PCI card. does not remove them from suspicion? midiman pair to see if these are involved in the problem? would I just have to reboot with no harm done? If the firmtek driver is your hard disk, definitely do not unload that, and com.apple. * drivers should "just work." However, Soundflower has shown up before in crash logs. I actually use Ambrosia WireTap for that purpose. I'd probably look into uninstalling that and seeing if that fixes the problem before I look at any others. I've attached the output of kextstat from this G5 so you have a point of comparison. Note this is a G5 instead of your G4, so the device drivers loaded will be a bit different. causing problems with a browser. Seems a bit mysterious. not causing me any difficulties. That I'm aware of. Now just one more little thing...sorry! Those fonts are not on your system; they're being downloaded from Apple, but there are attributes about it Apple Type Services in 10.4 (and, for that matter, 10.5, except the browser usually crashes in that case) doesn't like. The error is harmless on Tiger but annoying. 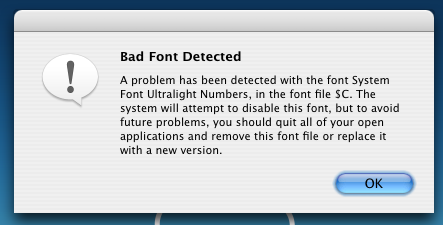 However, it is much more problematic on Leopard, so we have a built-in blocklist for fonts that do this. I'll update it for the next version of TenFourFox. For now, if you must get into iCloud from your Power Mac, go to about:config and search for gfx.downloadable_fonts.enabled, and set it to false (set it back to true when you're done). Interestingly, https://www.icloud.com/ loads just fine on 10.5. I get a lot of font warning messages in console.app, but that's it. This has been repaired in 45.5.0, which is now available as a release candidate on http://tenfourfox.blogspot.com/ . Cameron Kaiser closed this discussion on 13 Nov, 2016 03:11 AM. Detected messages, so much praise is to be heaped upon you. about 30 seconds, it returns to the login screen. icloud.com using this old Power PC. Unfortunately, I don't use icloud, so I can't really suggest further advice other than to see if other computers will load it. I'm going to close this ticket since both of the original items are dealt with and I prefer one issue per ticket to make it easier for people to find and participate in discussions. If you have a new issue to report, feel free to open a new one. Cameron Kaiser closed this discussion on 14 Nov, 2016 01:19 AM.